In a visual culture such as ours, it is hard to imagine a world nearly devoid of images of living people. But that was the case in Europe before the fifteenth century when artists devoted themselves almost exclusively to representing saints, biblical figures, and religious scenes. Secular portraiture was limited mainly to likenesses of rulers or images of donors tucked into the corners of altarpieces and other paintings of sacred themes. In fifteenth-century Florence, portraiture expanded to encompass members of the merchant class, who appear in scores of panel paintings, on medals, and as marble busts. Almost from the outset, this development included women as well as men. Virtue and Beauty focuses on the flowering of female portraiture in Florence from c. 1440 to c. 1540; it also presents several male portraits, Northern European or courtly analogues, and works that relate specifically to Leonardo's Ginevra de' Benci, one of only three female portraits painted by the master. The works of art on view illustrate the broad shift that occurred in this period from the profile portrait to the three-quarter or frontal view of the sitter. Over time the portraits of women also became larger in scale, more elaborate, and more communicative with the viewer. Early Renaissance portraits lack the psychological dimension characteristic of modern portraiture as they reflect a different conception of identity. In the case of women, the individual was seen in the light of her social status and role as wife and mother. Consequently, most female portraits were probably occasioned by the sitter's marriage, for which the ideal age was sixteen; men usually delayed marriage until their thirties when they could better shoulder the responsibility of a new household. Arranged by the families of the betrothed, marriages entailed a huge financial commitment in the form of the bride's dowry, which consisted of a gift of money plus a luxurious wardrobe. As the family's status depended on projecting a public image of financial success, the amount spent on the bride's clothes could represent a significant share of her family's worth. The groom responded with a counter-dowry of equally lavish clothing and jewelry. The earliest independent portrait from Florence to survive is Fra Filippo Lippi's Woman with a Man at a Window, which has been plausibly identified as portraying a young woman named Angiola Sapiti who married into the Scolari family in 1436. Most unusually, this painting includes a secondary portrait of a man, evidently her husband Lorenzo, whose hands rest on the Scolari coat of arms. As many wealthy Florentines owed their prosperity to the wool and silk trade, not surprisingly their female portraits feature the glories of that production. Angiola's opulent costume, with a velvet dress, fur-trimmed overdress, elaborate headdress, and brooches, annnounced the wealth of the Sapiti-Scolari alliance, making the painting as much a portrait of the dowry and counter-dowry as it is of the young couple. Most female portraits seem to date from the first years of marriage, after which time civic laws dictated that women should dress more soberly and refrain from wearing jewelry. The profile view commonly used for early Renaissance painted portraits conforms to the format of portrait medals, which Pisanello introduced in the 1430s. His Cecilia Gonzaga, representing the daughter of the duke of Mantua, is the first known Renaissance medal to portray a woman. Reflecting the humanist fascination with the classical past, medals emulated ancient Roman coins depicting the Caesars in strict profile. As the profile view was also used for images of female saints, it was eminently suitable for portraits of young brides, who were expected to bring honor to their husbands' families through virtuous behavior. The upright posture and averted gaze dictated by the profile format reinforced the impression of moral rectitude and echoed the Renaissance theorist Leon Battista Alberti's admonition that young women should comport themselves with self-restraint and "a grave demeanor." The painted profile portrait generally went out of vogue in the late fifteenth century, although it was still used under special circumstances. Domenico Ghirlandaio's Giovanna degli Albizzi Tornabuoni, for example, is a posthumous portrait, apparently commissioned by Giovanna's husband to preserve the memory of his young wife, who had died in childbirth. Although lifelike, early Renaissance portraits of women also conform to an ideal of beauty. Most Florentine women, then as now, were brown-eyed brunettes, yet they are often portrayed with blond hair, ivory skin, and sparkling eyes. These portraits reflect a canon of beauty derived from literature, especially from sonnets written by Petrarch in the fourteenth century in praise of his beloved Laura. Beauty was closely linked to virtue in Renaissance thought: because physical beauty signified an inner beauty of spirit, a beautiful woman was seen as an agent who could draw man to love, and through love, to God. A striking echo of Laura's portrait is Botticelli's Young Woman (Simonetta Vespucci?) in Mythological Guise. Her flowing golden tresses and braided hairpieces recall one of Petrarch's verses: "Breeze that surrounds those blond and curling locks, that makes them move...and scatters the sweet gold, then gathers it in lovely knots recurling...." Botticelli's portrait may fuse Laura's attributes with those of the renowned Florentine beauty, Simonetta Vespucci, Giuliano de' Medici's ladylove who died in 1476 at the age of twenty-three. The relatively large size of this painting possibly reflects another lost work: a portrait of Simonetta in the guise of the mythological goddess Athena, which Botticelli had painted on a standard that Giuliano carried in a ceremonial joust in Florence in 1475. While the profile portrait was de rigueur in Florence for most of the fifteenth century, artists in Flanders had been painting portraits of sitters turned in three-quarter view since the 1430s. Much admired in Florence, Flemish paintings hung in patrician palaces like that of the Medici, the city's most prominent family. In the 1470s, both Botticelli and Leonardo introduced this new type of three-quarter portrait in Florence. Botticelli's Woman at a Window (Smeralda Brandini?) 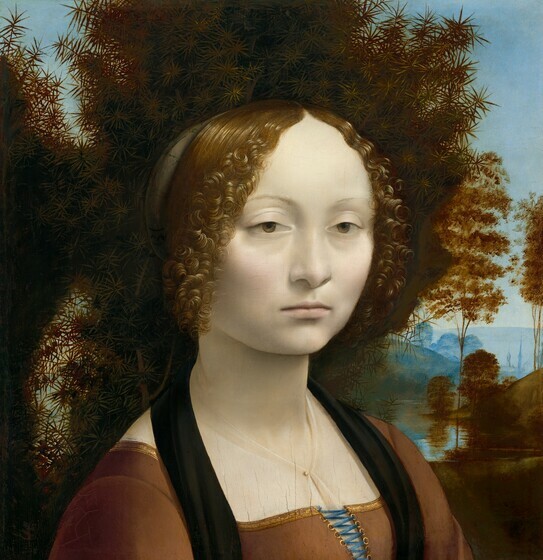 and Leonardo's Ginevra de' Benci represent a radical departure from prevailing conventions. Unlike the profile, which tended to conceal the sitter's individuality, the three-quarter pose reduced the barrier between sitter and viewer, bringing the two into eye contact. The new frontal gaze opened the door to portraiture that explored character as well as appearance. Botticelli, like his master Filippo Lippi, set his portrait in a palace interior, the domain of wives of wealthy Florentine bankers and merchants. Although Ginevra de' Benci had married Luigi Niccolini in 1474 and was, therefore, a young wife at the time of her portrait, Leonardo broke with tradition by placing her in an open landscape with spiky branches of juniper (in Italian, ginepro, punning on the name of the sitter). Several inches along the bottom of the painting were cut off at some time in the past, but a drawing by Leonardo in the exhibition suggests that the missing portion contained her hands. Verrocchio's innovative marble bust of a Lady with a Bunch of Flowers, which some scholars speculate also portrays Ginevra de' Benci, offers another clue to the original composition of Leonardo's painting. The Renaissance equation of virtue and beauty meant that even women who were not beautiful had to be made to look so in order to appear virtuous. To represent the moral aspect of beauty, artists attempted to fuse the real and the ideal, reconciling a convincing likeness with a poetic idealization of the sitter. Another way to portray virtuous beauty was by means of mottoes, emblems, or allegorical scenes depicted on the reverse of medals or paintings, which made explicit the connection between a sitter's outward appearance and inner nature. The reverse of Pisanello's Cecilia Gonzaga, for example, suggests Cecilia's virtue (she became a nun) through an image of a maiden taming a unicorn, which according to medieval lore could be captured only by a virgin. The daughter of a wealthy Florentine banker, Ginevra de' Benci enjoyed a reputation as an accomplished poet and was herself the subject of several poems by writers in the Medici circle celebrating her beauty and virtue. To convey these qualities, Leonardo painted on the reverse of her portrait a wreath of laurel--the crown of poets--and a palm of fame encircling a sprig of juniper. 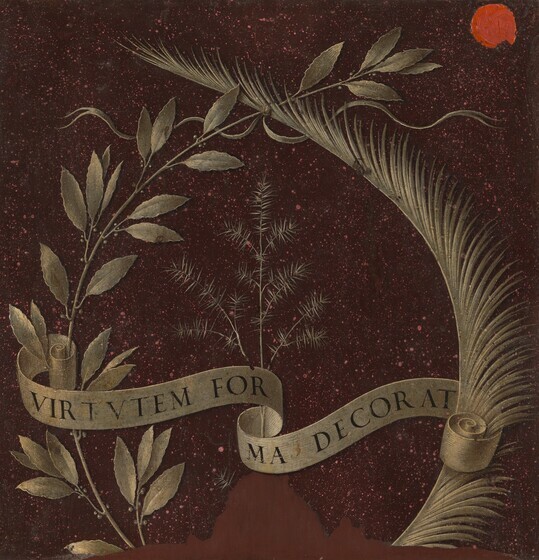 Entwined around the plants is a scroll with the Latin inscription for "Beauty Adorns Virtue." Similar emblematic reverses are found in a number of other portraits in the exhibition, including Jacometto Veneziano's Alvise Contarini. The chained deer and Greek inscription AIEI ("forever") on the reverse of Contarini's portrait proclaim his everlasting fidelity to his wife. In the first half of the sixteenth century, portraits became larger and included more of the sitter's body. This new type originated with Leonardo's Mona Lisa, which portrays the sitter in a relaxed pose with her hands resting in her lap. Bronzino reflected Leonardo's influence in his Portrait of a Lady, thought to represent Francesca Salviati at the time of her second marriage to Ottaviano de' Medici. The painting projects a new emotional warmth and sense of character: Francesca's astute gaze, frank expression, and hint of a smile suggest an amiable woman of intellect, wit, and self-confidence. The attentive lapdog adds a note of playfulness, as does the gilded face of a grotesque on the arm of the chair, intended to remind us that all faces are masks. The exploration of character seen in this vibrant portrait would be short-lived. In 1537, the Medici consolidated their power and transformed formerly republican Florence into a duchy. After establishing their family as the city's hereditary dukes, the Medici commissioned elaborate portraits that emphasized dynastic connections. Unlike fifteenth-century images of beautiful young wives, female portraits of the early-to-mid-sixteenth century depict mature women, sometimes accompanied by their children. The paintings of women in the Medici circle by Pontormo, Bronzino, and other artists took on the force of official court portraits. With masklike faces and rigid bearing, the women appear as icons of power in portraits that relinquish individuality in favor of courtly elegance and grandeur.